Network Rail is urging parents to warn their children about the risk of playing near or misusing level crossings.The message comes after a survey at a level crossing in Cheshire and a second footpath level crossing nearby revealed children were not using the crossings safely. 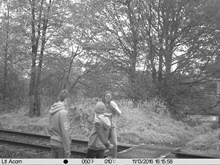 Two images taken between 11 and 13 November at Brookhouse Farm footpath level crossing between Alsager and Radway Green, clearly show a group of children on the crossing using it incorrectly .This follows two incidents in October where children were reported playing ‘chicken’ and trespassing on the line at Alsager station. There were also near misses at Brookhouse Farm level crossing in June where three children were on the crossing and came close to being struck by a train on its approach to Alsager station. Network Rail’s community safety team and level crossing manager has visited the local area in recent months speaking to schools to help educate pupils on the risks attached to playing on or around the railway and distributing information leaflets to local homes. Nick Jordan, community safety manager for Network Rail, said: “We’re urging parents to make sure their children understand the dangers of trespassing on the railway and misusing level crossings.